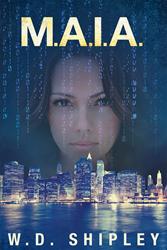 Recent release “M.A.I.A.” from Page Publishing author WD Shipley is an exhilarating book that will leave the reader wanting more. Will Alix and his friends be able to escape the agency? WD Shipley, a passionate writer, has completed his new book “M.A.I.A.”: a riveting and courageous story of a sniper that is oppressed by technology and the chip in his mind. Why is he programmed differently? WD Shipley graduated from the University of Massachusetts Lowell where he studied the art of creative writing under some of today's greats in the industry. The young writer’s supportive parents remember finding their son asleep at his computer, up all night trying to finish his first manuscript in high school. Since then, Bill aspires to tap into the human emotion and leave his mark on society today, tomorrow and forever through his words on the page. He believes in following your dreams and never giving up. He currently resides in New Hampshire pursuing his own dream of starting a family and living a simple, successful and happy life with the love of his. Published by New York City-based Page Publishing, WD Shipley’s exhilarating tale will not disappoint. Alix Basil, a sniper in a military community oppressed by technology and mind chips, realizes when he couldn’t pull the trigger in a virtual reality simulation, he’s not like the others. His target resembled that of his girlfriend, Anna, a medic who sneaks out into simulation to meet him after shut down. On an island off of enemy-controlled, post-war New York City, Alix accepts that he sees things much more clearly than his peers, but why? Together, Alix and his team must truly find themselves and who they are without their technological predispositions and programming. But, how far does M.A.I.A. 's (Manufacturing Artificial Intelligence Agency), and its supercomputer's influence reach? Readers who wish to experience this mesmerizing work can purchase “M.A.I.A.” at bookstores everywhere, or online at the Apple iTunes store, Amazon, Google Play or Barnes and Noble.